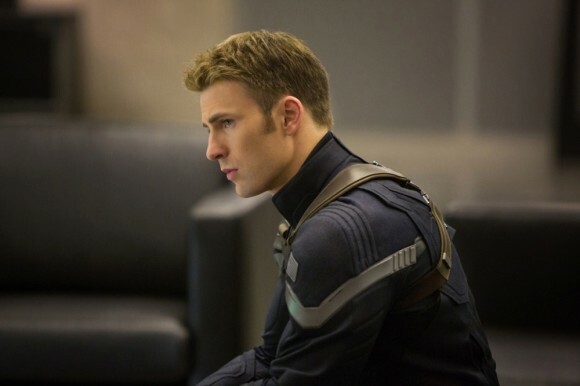 A face from the past sees new danger for Steve Rogers in the superlative sequel CAPTAIN AMERICA: THE WINTER SOLDIER. The movies you love the most are sometimes the hardest to write about and this one is among the best I’ve seen this year, so I’ve taken my time. Let’s hear it for Captain America: The First Avenger I wrote when Joe Johnston’s terrific 40’s set movie was released in 2012. Now it’s time to cheer again because the sequel CAPTAIN AMERICA: THE WINTER SOLDIER is a superlative modern-day set action thriller. ‘Smart, witty and above all completely thrilling’ I tweeted as I came out of seeing this for the first time but oh, it was so good, I just had to see it twice! Since The Avengers, Steve Rogers (another wonderfully assured and focused performance from the always winning Chris Evans) has become a vital part of S.H.I.E.L.D. – the super covert agency that surely has the best abbreviated name in the business. 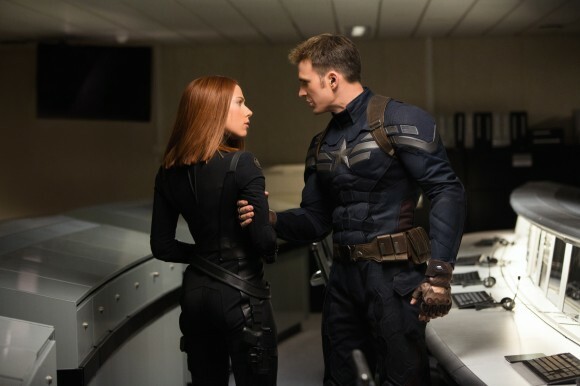 He’s partnered now by the ever huskily-voiced, ever sassy agent Natasha Romanoff (Scarlett Johansson, as detailed and fascinating as ever), dispensing bad guys with consummate ease. But all too soon, a new era of advanced weaponry is being ushered in courtesy of the suited, smooth, one and only Robert Redford as S.H.I.E.L.D. honcho Alexander Pierce. Nick Fury (Samuel L. Jackson in possibly his best performance yet as the super spy) wants to be cautious but with new threats rearing their ugly head every day, Pierce wants to act. Very soon, Steve discovers that the organisation he’s been fighting for is definitely hiding something but it’s a face from the past that presents the most danger for our Captain this time round. Maybe a chance encounter with Anthony Mackie’s excellent quip-witted vet Sam Wilson will help him connect with very the modern Washington that’s now his home and provide a much needed ally when things get tough. “This isn’t freedom. This is fear.” says Cap as he watches the evolution of this new weaponry. His caution at these new events creates tension in his relationship with Natasha and Fury but whereas the first movie told you in its title that this origins story was all about our hero, the sequel makes you realise that as much as we’ll see Steve try to acclimatise to his new world, this is also about the ghost known only as THE WINTER SOLDIER. When he first appears in a stunning ambush sequence, his face is all but hidden by goggles and mask and what’s most noticeable is his strength and speed – not unlike Steve. But a metal arm and a red star on his shoulder signify he’s the Russian assassin that people have spoken about in hushed tones and never really seen until now. What we’ll soon find out is that the man behind the mask is none other than Steve’s best friend Bucky Barnes, who we saw fall to his death in The First Avenger but because he’d been experimented on by Dr Arnim Zola (the brilliantly sneaky Toby Jones), he survived, was then brainwashed to forget who he was and turned into THE WINTER SOLDIER. What is apparently one of the finest and most gasp-inducing reveals in all of the Marvel comics, directors Anthony and Joe Russo make one of the high points in the movie. This meeting and the subsequent battles between these two, forms the latter half of the movie and it’s totally thrilling stuff. Steve’s anguished face at the idea that his enemies have chosen the one person who they knew would inflict the greatest pain on him, someone who’d be his Achilles heel – Bucky – is emotional and riveting. But what the Russo brothers have also brought to life so expertly in this sequel is the wonderful feel of 70’s paranoia to the whole enterprise – shadowy conversations, people definitely not being who they initially seem, hidden agendas – and it underpins the movie giving it nuances that we’re not really used to seeing in these kinds of films. The action sequences are excellently staged and fluidly edited but there’s a depth to everything as well, a thinking that the vision of surveillance Pierce talks about, isn’t that far away for us. Maybe it’s Robert Redford’s presence in the cast but everyone really is on top form here, with Evans and Johansson displaying a great prickly / flirty relationship that develops into something much more – a friendship. Anthony Mackie is just great in everything I’ve seen him in from Half Nelson onwards and he’s marvellous here too, giving the lightest of touches to the smartest of lines. After his phenomenal turn in All Is Lost, it’s nice to see Redford in a very different guise in this film and Sebastian Stan is a brilliantly driven and then conflicted Bucky. We’re left with an absolutely tantalising set up for the next instalment and after the climatic battle, the use of single piano notes is another example of the delicacy in counterpoint to the sweeping action and another masterstroke in Henry Jackman’s fab score. But before we speculate on what could follow, a second viewing confirmed for me that CAPTAIN AMERICA: THE WINTER SOLDIER can stand alongside what I consider the most accomplished Marvel movie yet, the totally wondrous Iron Man Three.